Apparently my review will mean nothing, as said by the owner. But I would appreciate if you take to time to read this. 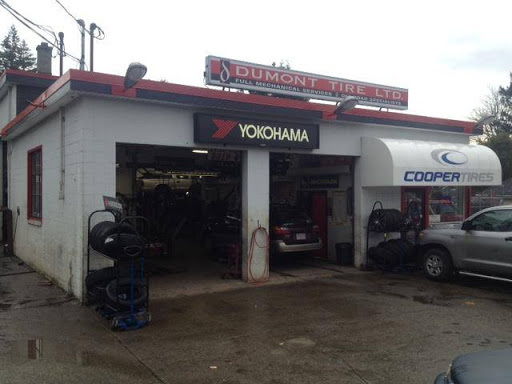 I first had my vehicle towed to dumont tire after I found that my engine was knocking due to lack of oil. I did this even after hearing bad things about the shop. There were a few other minor things that needed to fixed as well. I was told that the mechanic had the engine running and they diagnosed the knock. they came to the conclusion it would need a ew motor. I agreed and we got a engine on its way. The first issue I ran into was the price. 1500$ for and engine and they wanted the core. I agreed to the price as it was compression tested and seemed okay. End of the month comes around and my car hasnt even been on the shop. I get the old "your car wasnt priority", even though it was there for a month and there could have been time alloted. 1 week later.. still nothing, hasnt even seen the inside of the shop.. Another week and it "getting there". Apparently they ran into some issues that no other miata mechanic has, and has extended the time another week? Once I finally get the car itd not even good. Smells of oil terribly, stalls out when reversing, and the throwout bearing is on its way out. I personally think youd be able to hear the annoyingly loud chirp that is associated the the throwout bearing going. But this apparently was an oversight. Questionable as the engine was out of the car and they had ample opportunity to diagnose the issue before. When I went to talk to the owner about the clutch he told me thats not how it was when it arrived. The throwout bearing went while the car wasnt even running? Apparently the owner felt put off when I questioned him about the clutch and other issues. Got very defensive and really had no good reasoning. I felt as though Ive been ripped off and scammed. I dont wish to try and make things right as there are far more superior shops out there. I will be reminding people daily of the garbage my car and I had to go through. Thanks Jason!! p.s. this is my second review as I already gave them a chance. maybe this time the review will be taken the right away and wont be defended with personal jests. Great place. On several occasions theyve repaired my issues and never once tried to exaggerate or up-sell me. Even when they had the opportunity. For example, my wife had a tire blow out and I was worried about damage to the rim. It turned out to be fine, and they said I only needed a new tire. It was the perfect opportunity for a lesser garage to lie about damage and sell me a whole new wheel. Dumont will not take advantage of you, they will help you in the most cost effective way and not try to rip you off. Id ignore that other reviewer thats spamming the 1 star reviews under multiple fake names. Had a slow leak this morning struggled to remove tire in the rain -- after much poor use of English language couldnt remove the tire got to Dumont at 8am on a Monday and was out in 20 mins with fixed tire and still made my appointment in Victoria. I am grateful for the quick fair priced service. More business coming your way gentlemen. We needed an emergency flat repair on a recent Saturday while on vacation in the area. Stopped in and got immediate service. Very fast and friendly and super value. Thanks Jason R - you were great. Fantastic service! We just called on a Sunday as our van wasnt working and the owner drove to us and helped us get our van on the road again!! Saved our vacation. Very honest guy, highly recommend! Got new tires on my truck and wheel alignment. Needed new ball joints and front brakes too. Dumonts have me all set. They always provide good service and are there to help if I have any issues. Supplied and installed a battery while I was travelling and the service was great and the price fair. Couldnt ask for anything more. Jason and the entire staff here are simply the best. These folks "get" customer service! Pleasure to deal with....I will be back! Have been a client of Jasons for at least 10 years and highly recommend them.